This Typus Generalis Ukrainae sive Palatinatuum Podoliae, Kioviensis et Braczlaviensis terrs nova delineatione exhibens. (London), Jansson-Moses Pitt, (1680), map is Moses Pitt’s edition of Beauplan’s “general map of Ukraine”. 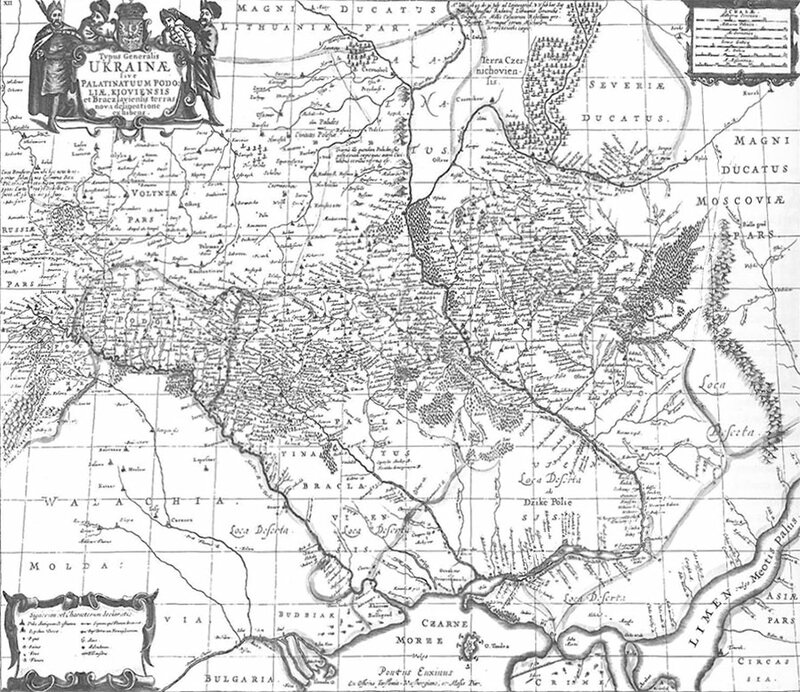 Beauplan’s map was originally engraved by H. Hondius of Gdansk in 1648. The cartographer Guillaume le Vasseur de Beuplan was a Frenchman who, in 1630, enlisted in the Polish army under King Sigismund III and remained in the employ of the Polish Crown until his dismissal by Hetman Potocki in 1647. From 1631 to 1639 he directed the construction of numerous Polish frontier forts in the western and central Ukrainian lands, including Bar, Brody, Kremenchuk and Kodak. During this period he had the opportunity to survey and map the Ukrainian territories, recording his topographical observations and measurements with great precision and care. Beauplan’s “general map” contained an enormous amount of data and even included information from Polish military intelligence sources on the inaccessible Dzike Pole, or southern steppes of Ukraine. His mapping of Ukraine’s hydrographic system was also unparalleled. Prior to Beauplan, for instance, no map showed the characteristic eastward curve or sharp break in the lower course of the Dnieper at the cataracts. After Beauplan, any quality map of the region would include this information.